Addoco is committed to recycling and cons erving our natural resources. As a wood pallet recycler we repair used pallets, dismantle discarded pallets and remanufacture pallets with new or used lumber. The rebuilt pallets are inspected to make sure they are of the same durability and quality as a new pallet. If the pallet can no longer be used we recycle as much of its material as possible. Where once damaged pallets filled up landfills they now serve a purpose. The pallet is taken apart with the wood processed into landscape mulch. Wood pallet recycling is more than just the wood, however. The nails from the pallet are either reused or collected and sold as scrap metal. Cardboard from the pallet is baled and sent to recycling plants. Any wood waste is used to heat our plants, thus further conserving energy. Return and repair programs are available and customized to meet your specific needs. 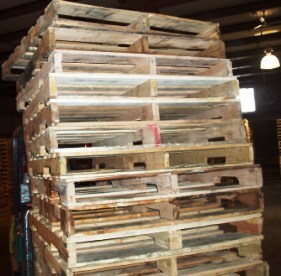 This can include picking up any scrap pallets on a regular basis. And for our h igh volume customers we can customize a drop trailer program.